Military • Job fair and other events scheduled this week along the Wasatch Front. 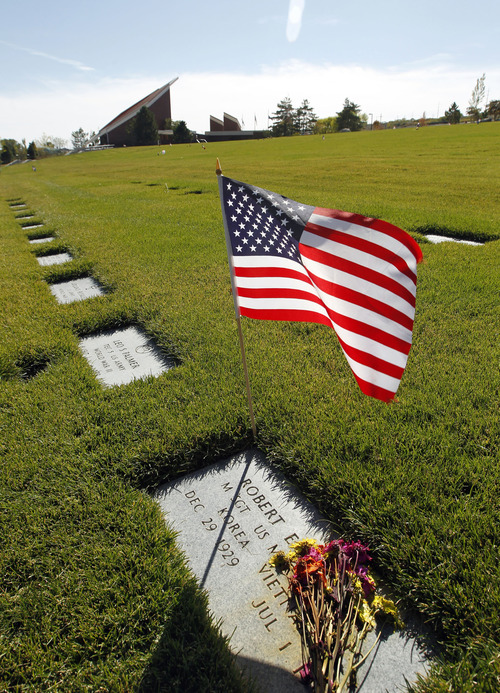 Al Hartmann | The Salt Lake Tribune Headstones for servicemen at Veteran's Memorial Park and Cemetery near Fort Douglas. Vietnam and Korean war veterans will be the focus of many of Utah&apos;s Veterans Day celebrations this week, but there is also a job fair planned that will be of interest for younger vets. The Utah Department of Veterans Affairs plans to give commemorative coins to Vietnam vets who attend its ceremony at 11 a.m. on Sunday, Veterans Day, in the State Capitol Rotunda. Speakers will include Gov. Gary Herbert and five veterans are to be honored for distinguished service. The Utah National Guard&apos;s 23rd Army Band will perform. At the same time on Sunday, Taylorsville will host its Veterans Day Parade, with the theme "Welcome Home, Korean and Vietnam Veterans." It will run along 2700 West, from 4700 South to 5400 South. A program featuring Maj. Gen. Jefferson Burton, adjutant general for the Utah Army National Guard, a flag ceremony and displays will begin at 12:15 p.m. at Taylorsville City Hall, the end of the parade route. Also on Sunday, Layton City will hold its Veteran&apos;s Day Commemoration program at 11 a.m. at Central Davis Junior High&apos;s gymnasium, 663 N Church Street. The program will include patriotic musical selections and guest speakers. Refreshments will be served for the veterans in attendance at the conclusion of the program. • A panel discussion on the Korean War, with veterans of the war, is planned at 7 p.m. Monday at the Salt Lake City Main Library auditorium. • Weber State University is planning a fallen soldier ceremony on Wednesday at noon on the quad at the northwest entrance to campus. Those planning to attend the veteran appreciation luncheon that follows at 1 p.m. in the Shepherd Union Ballroom should contact the veterans office, 626-6039, by 5 p.m. on Tuesday. The free luncheon will be limited to 100 on a first-come-first-served basis. An exhibit of World War II memorabilia will also be on display in the Shepherd Union Atrium from 9 a.m. to 1 p.m. that day. • A benefit concert for the Freedom Landing Veterans Homeless Shelter is planned by Salt Lake Community College&apos;s Student Veterans Association on Wednesday from 7 p.m. to 10 p.m. at South City Campus Grand Theater. Live performances will be provided by Matt Lewis and Joel Pack. General admission is $15 and students or veterans with ID, $10. • A job fair, "Hiring Our Heroes," will be held Thursday at the South Towne Exposition Center, 9575 S. State St. in Sandy. It will run from 11 a.m. to 3 p.m. and is for veterans as well as active-duty military, Guard members and spouses. It is sponsored by the U.S. Chamber of Commerce and a host of other organizations. • All service women are invited to a celebration Thursday from 12:30 p.m. to 3 p.m. at the George E Wahlen Department of Veterans Affairs Medical Center, 500 Foothill Drive, Salt Lake City. Details are at http://1.usa.gov/TUVjXO. • The University of Utah is planning its Veterans Day service on Friday, beginning at 11 a.m. in the ballroom of the Olpin Union Building. There will be a rifle salute and full-dress military uniform ceremony paying tribute to 11 Utah veterans. A panel discussion on "Korea: The Forgotten War" will precede the ceremony, from 8:45 a.m. to 10:15 a.m. in the Union Theater, Olpin Union Building. • Utah Valley University Army ROTC plans a ceremony at 11 a.m. Friday at the amphitheater in The Courtyard. Col. Val L. Peterson, a military intelligence officer in the Utah Army National Guard as well as a legislator and UVU vice president, will give the keynote address. Children from Vineyard Elementary School will perform. • On Saturday, a 10 a.m. Veterans Day parade is scheduled in Ogden. • The Utah National Guard will host its 57th annual Veterans Day concert on Saturday at 7 p.m. at the University of Utah&apos;s Jon M. Huntsman Center. The Guard&apos;s 23rd Army Band will perform, as will the 600-voice Granite School District&apos;s high school combined choir. • The SCERA Center for the Arts in Orem will celebrate Veterans Day on Saturday at 11 a.m. with a variety show. Performers will include SCERA staff member Shawn Mortensen, The Bluth Sisters and the Mountain View High School Choir and others. The center is at 745 S. State St. in Orem. • Country singers Collin Raye and Nathan Osmond as well as Utah musician-composer Kurt Bestor will perform during a 3 p.m. ceremony at the state Capitol Rotunda on Nov. 12. The families of six fallen servicemen from Utah are expected at the event sponsored by The American Fallen Warrior Memorial Foundation. • Also on Nov. 12, Weber State will honor the fallen by hosting a reading of the names of Utah soldiers who have died in service since 9/11. The reading will be held at 11 a.m. in the Shepherd Union Atrium. • Flag raisings are planned at main flag poles on SLCC&apos;s three campuses at 8 a.m. on Nov. 12. Refreshments and ribbons to honor veterans will be offered. • On Nov. 14, a "Healing for our Wounded Warriors" program is scheduled for noon to 2 p.m. at SLCC&apos;s Taylorsville Redwood Campus Oak Room. Terry Schow, executive director of the Utah VA, and Dean Zenoni, Ride 2 Recovery participant and SLCC veteran, will speak. Guests can write to troops and hang ribbons on the Veteran&apos;s Honor Tree.